“Switch off the mobile, forget about the news and don’t even get near e-mail. Let the greatest stress be guessing which duck swims upstream first”. Thank you once again for a fantastic weekend away in your cabin, we had a wonderful time, great weather !!!! And lovely walks. Wonderful stay - lodge very comfortable and cosy and a great setting. Went over the Wrynose and Hardknott passes. The ultimate roller coaster ride! Not for the faint hearted but spectacular! Setting fantastic and very central. Walking included Wansfell Pike, Catbells, Ullswater and Castle Crag - Alan and Judy. Very comfortable Lodge, had a great long weekend. Kids and dog had a great time walking and playing in the park. We will be recommending it to all our friends. Just wanted to say that we had a lovely time at your lodge. We did so much walking that I needed a week off when we got back! Would like to say again a big thank you. Even though the weather and floods got bad it still did not put us off, it's such a lovely place. An ideal weekend. Great cabin with everything you could possibly need. We enjoyed some excellent trips into Ambleside and Windermere, even stopping by Grasmere for the famous gingerbread. The chilly morning coffees on the balcony will be greatly missed. It will be a shame to leave. We spent a lot of time at the Queens Head pub. Very dog friendly and good food......especially the chocolate cheesecake! Perfect lodge, stunning location. Perfect weather for a cosy break - lots and lots of walking, hill climbing etc, (3ft of snow on top of Helvellyn), and of course eating and drinking. Thanks for a great week. Thoroughly enjoyed our short stay in the cabin. Many thanks for the walk guide, we were amazed by the beautiful views. We had a great time (again) this year. The cabin’s location is very central, peaceful and not overlooked. We had some wonderful walks through breathtaking scenery and did a steamer trip to discover the other end of Windermere. Lovely log cabin, very peaceful and very well equipped. Did the Troutbeck walk and even the dogs slept for hours afterwards. Came here for our honeymoon. We found it just how we wanted it, a cosy lodge in such a beautiful and scenic but peaceful location. We are thinking of coming back next year and bringing the children as there is so much to see and do they would just love it here. What a lovely log cabin. The kids loved the river. What a fantastic holiday ! Great weather we went to Ambleside, Wndermere and Bownes. Accommodation brilliant- cosy, clean and provided everything. Thanks for a pleasurable stay. A really wonderful stay. We visited, Hawkeshead, Grasmere and Newby Bridge. Breathtaking views, just amazing. Loved the log cabin so cosy and warm. Our 4th visit in your lovely log cabin. We always look forward to coming here. Love the balcony. 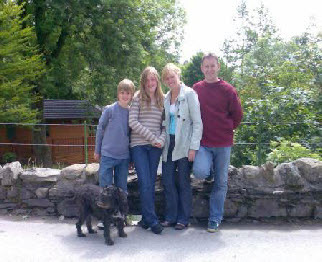 We have had a lovely visit to the Lakes and Riverside Lodge once again. Lots of walking and laughing – good times. Very pleased, very comfortable, felt relaxed. All equipment provided, good information, excellent location. What a warm cosy and quaint little place. The kids love to feed sugar lumps to the horses. We will definitely come here again. The lodge felt like home from home from the day we arrived. Warm, cosy, clean and comfortable. The Lakes always offer so much and we never have time to do it all. Had a fantastic break the Lodge was so comfortable. Wished we‘d booked for the week! Had a really relaxing time. Did the Troutbeck Valley walk just right for us. Lovely lodge and location our batteries have been recharged! We loved it here, beautiful views and cosy cabin. Had everything we needed and loved being by the beck- so peaceful and lovely 5 days just wasn’t enough. Our first visit to the Lake District and we loved every minute of it. The log cabin was really lovely and cosy. Had a lovely time and the scenery is beautiful – a perfect place to have our anniversary. Very cosy Lodge. The kids loved the river pool and the rope swing. Comfy beds, well equipped kitchen and a lovely view for a barbeque. We have all enjoyed our stay at Puddleduck Lodge – dog included! Loved sitting on the balcony with a drink, looking at the view and listening to the sound of the beck. Lovely, tranquil setting and lodge. Loved feeding the ducks whilst having breakfast on the balcony. Came here to get away from it all. Loved the beauty of The Lakes. Riverside Lodge is great and the local wildlife can be seen from the balcony everyday. Check out the stars at night- fantastic ! This lodge has to have the best plot on the site. Had a fabulous New Year break. We will all be coming again – definitely. Don’t want to go home tomorrow so we are hoping it will snow. Had a fantastic time at the lodges again and walked 24 miles in 3 days! Climbed six more mountains! When we first arrived we read the comments in the guestbook and, as nice as they are they don’t do the lodge justice. This has been the trip of a lifetime , Puddleduck Lodge is beautiful, cosy and quiet. Like the comments before we have had a fantastic break. The Lodge is cosy, warm spacious and quiet and had all the things we needed. We enjoyed some good walks and the fabulous views - thanks for the use of the maps in the lodge. Having got married on Saturday we were told about the Lodge being a place of total peace and quiet. We have to agree. It has perfect views and surroundings. We do not want to leave! We’ve had a wonderful relaxing stay, simply splendid. Had a lovely stay at the Lodge, which had everything we needed, peaceful, clean and cosy. The girls went horse riding a a couple of times. A fantastic fortnight! The Lodge has all the home comforts and the park all the amenities. The area is beautiful. Enjoyed lots of walks, canoeing , steamer ride and loads more. A great active holiday! Had a look at the previous comments in the guestbook and its clearly not possible to have a bad time here! We’ve decided its’ one of the best locations by water. This is our second visit to Puddleduck Lodge and again we’ve had a lovely time. Alfie has loved playing football , feeding the horses and splashing in the stream. We could not have wished for a better place to celebrate our first anniversary.Had a lovely boat trip on Windermere - we will be back! We had a great stay, can not believe I have left it till I am 50 to see Lake District. We’ve just come back from an amazing week in your beautiful Riverside Lodge, the site and location were absolutely perfect.